Drain the M/T fluid. Refer to TM-19, "Draining". Remove the nut and bolt from the lower ball joint. Disconnect the steering knuckle from the transverse link. Remove the drive shaft from the wheel hub and bearing. 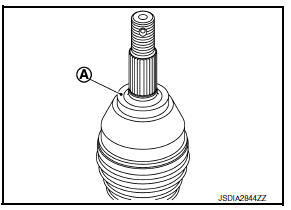 Insert the Tool (A) between the shaft and the transaxle. Install a suitable tool (B) to the Tool (A). Remove the drive shaft from the transaxle. Confirm that the circular clip is attached to the drive shaft. Remove the differential side oil seal. Refer to TM-20, "Removal and Installation". Inspect the components. Refer to FAX-24, "6M/T : Inspection". Install a new differential side oil seal. Refer to TM-20, "Removal and Installation". Do not reuse the differential side oil seal. 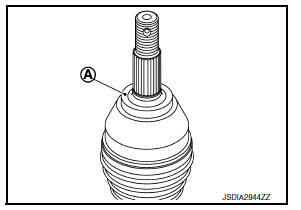 Place Tool (A) onto the differential side oil seal to prevent damage to the oil seal while inserting the drive shaft. Slide drive shaft sliding joint and tap with a hammer to install securely. Check that circular clip is completely engaged. Refill the M/T oil. Refer to TM-19, "Refilling". Remove the bolts and the support bearing bracket plate. Remove the drive shaft from the transaxle. If necessary, remove the support bearing bracket bolts and the support bearing bracket. Tighten the support bearing bracket bolts in 2 stages in the order of 1 to 4 as shown. Install the support bearing bracket plate (2) with the notch (A) upward. 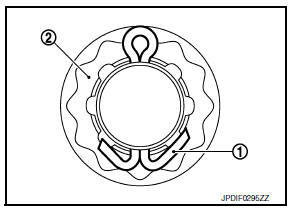 Tighten the support bearing bracket plate bolts in 2 stages in the order of 1 to 2 as shown. Do not reuse the support bearing bracket plate. Check the following items and replace the part if necessary. Move the joint up/down, left/right, and in the axial directions. Check for motion that is not smooth and for significant looseness. Check the boot for cracks, damage, and grease leaks. Check the support bearing bracket for cracks, deformation, and other damage. Check the shaft for runout, cracks, or other damage. 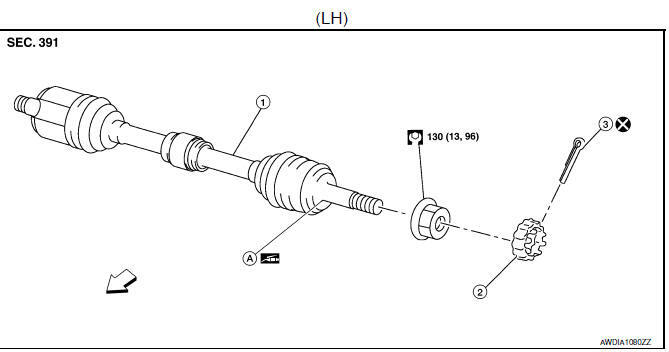 Replace the shaft if necessary. 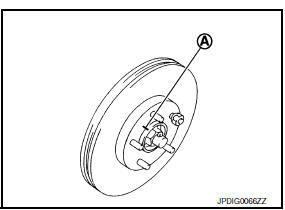 Check the dynamic damper for cracks or wear. Joint sub-assembly for rough rotation and excessive axial looseness. The inside of the joint sub-assembly for entry of foreign material. Joint sub-assembly for compression scars, cracks, and fractures inside of the joint sub-assembly. 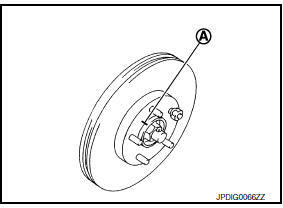 Replace the joint sub-assembly if there are any non-standard conditions of components. Replace the housing and spider assembly if there is scratching or wear of the housing roller contact surface or the spider roller contact surface. Replace the housing and spider assembly as a set. Verify the support bearing rolls freely and is free from noise, cracks, pitting or wear. 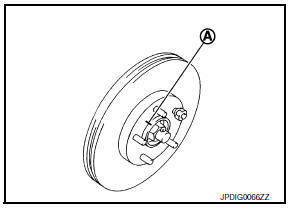 Replace the support bearing if there are any non-standard conditions. 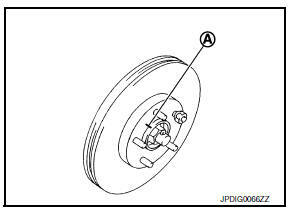 Check the support bearing bracket for cracks or damage. 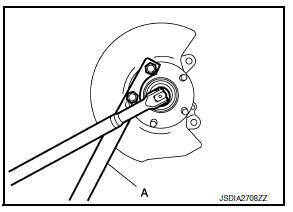 Replace the support bearing bracket if there are any non-standard conditions. 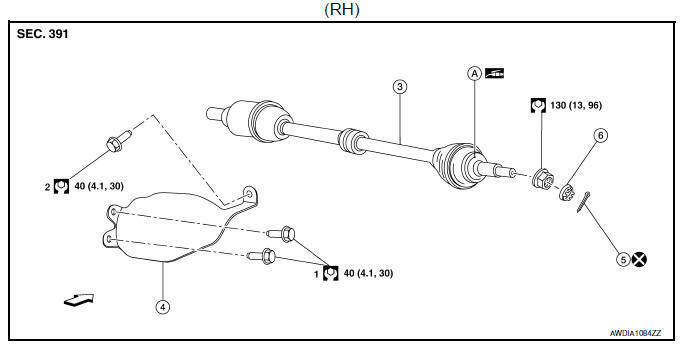 For the (RH) drive shaft, remove the bolts and the heat shield. Remove the differential side oil seal. Refer to TM-271, "Removal and Installation". 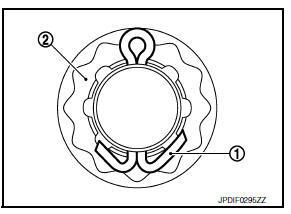 Install a new differential side oil seal. Refer to TM-271, "Removal and Installation". Check the CVT fluid level. Check the CVT for leaks. Refer to TM-250, "Inspection".